A taste of synthetic performance and pricing expectations. There have been quite a few potential leaks in relation to AMD's upcoming Ryzen CPUs. I held off posting some of the latest rumors pending additional details, and those have now arrived. These latest leaks add further fuel to the Ryzen fire. First, some benchmarks were posted for AMD's Ryzen CPU in the Passmark database, apparently courtesy of German system builder BoostBoxx. The specific Ryzen model is ZD3406BAM88F4_38/34_Y—quite the complex naming scheme at first glance. Digging into the details, this is the 8C/16T (8-core/16-thread) Ryzen part, with a base clock of 3.4GHz and a turbo clock of 3.8GHz. This is still a pre-release sample, but the B-stepping suggests it should be indicative of final retail performance. Of course there's a catch. The test system from BoostBoxx uses a GTX 1080 graphics card, but it pairs that with an MSI A320M Pro-VD motherboard and 16GB DDR4-2400 memory. This is essentially an OEM build, which are often price optimized in ways that don't always make sense. In this case, using the entry-level AMD AM4 chipset, the A320, may hinder performance slightly, and the same goes for the DDR4-2400 17-17-17 RAM, but it's important to keep the big picture in mind. Passmark's PerformanceTest v9 is a synthetic benchmark, meaning it tests CPU performance at a low level and often has short code snippets that run mostly from the L1/L2/L3 cache. Because of this, I wouldn't expect the RAM or motherboard to matter much, unless the firmware on the board isn't final. And unfortunately, that's likely the case, as the turbo modes are apparently disabled on the Ryzen part. Click through the gallery for additional test results. The overall score might seem like the most useful of the results, but the problem with synthetic tests is that they can be highly influenced by optimizations. In this case, Intel's CPUs are often the default, and with these being pre-release benchmarks, there's no reason to expect Ryzen-specific optimizations. By that metric, Ryzen is at a disadvantage, but this is also the way the real-world software industry often operates. As usual, keep in mind that these are preliminary leaked results, so performance is most definitely not final. Individually, Ryzen 3.4GHz makes a good showing in many of the tests, with particularly strong Integer, Floating Point, and Encryption scores. On the other hand, the Prime Numbers, SSE, and Physics results are less promising. Single-threaded performance puts per-core performance right in line with Intel, provided clockspeed is the same. The performance improvements in most of the tests are also very large when you look at AMD's previous top-end CPU, the FX-8370. The thing is, the FX-8370 results also illustrate the problem with relying too much on synthetic benchmarks like Passmark. In my normal CPU tests, using benchmarks that stress the hardware in a more 'realistic' fashion, the FX-8370 rates about 15 percent slower than in Passmark v9. I'm not able to run those on Ryzen yet, since I haven't received hardware (and would be under NDA if I had), but Ryzen does appear to be similar to Intel architectures in many areas, with overall performance looking very similar to the i7-5960X (and i7-6900K), all at about half the price. There are two turbo frequencies, the standard turbo that should work on all approved cooling solutions, and the XFR or "eXtended Frequency Range" turbo that will potentially allow for higher clockspeeds with better cooling (eg, liquid cooling). The XFR numbers aren't particularly informative, unfortunately, as they're all the same as the base turbo only with a plus-sign suffix. What we'll really be interested in testing is how far XFR will go without end-user intervention. I'm not expecting too much, meaning manual overclocking will still be useful for extracting the most from the chips, but I'd love to see XFR get at least 80 percent of what manual overclocking will achieve. Pricing is the most interesting aspect of the leak, and if correct it will put AMD into serious contention with Intel at every level. 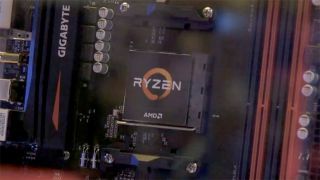 Given all of the Ryzen CPUs are also shipping with unlocked multipliers, binning will likely put the best parts as Ryzen 7 1800X, but the 1700X and 1700 may only lose out on 100-200MHz with manual overclocking. We could potentially see 8C/16T Ryzen 7 parts for $320 that will rival the performance of Intel's $1050 Core i7-6900K. As before, all indications point to a March 2 launch date, as we've previously noted. I'm particularly excited to see how the gaming aspects of Ryzen stack up against Intel's Core i7 and i5 parts, and with the potential to overclock even the budget-friendly Ryzen 3, this could be the most interesting CPU to come out of AMD in a decade.